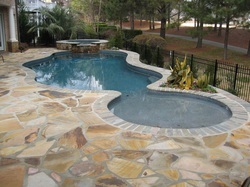 Sunbelt Pools has been in business for over 30 years, and in Atlanta since 1989. We have served both the commercial and residential swimming pool markets since our inception. Because of our extensive experience and training, Sunbelt Pools has both the knowledge and the qualifications to meet the needs of both the homeowner and the commercial swimming pool operator. We offer full-service year-round maintenance and repairs to the Metro Atlanta area. Our factory certified and trained technicians get the job done on time and on budget.We have the largest selection of chemicals and maintenance equipment in Georgia. We also offer same or next day delivery for Metro Atlanta customers. We provide design, construction, and renovations for both commercial and residential projects throughout the southeast. For a sampling of our work, please see our slideshows on our Commercial and Residential pages, then feel free to call us at 770-455-7770 to begin your pool project.